Have you ever watched a house cat sneak across the living room, stalking a toy? She is in ‘hunt’ mode, and it is characteristic of all predators, the world over. The head is down, shoulders hunched, tail carried low and the hips low. Each foot is placed with careful attention. Each step is quiet, and careful to avoid missteps. And, though out the stalk, the predator’s eyes are riveted on their prey. This is a body language that is instinctively recognized by any critter in the world. If you are a mouse, and don’t recognize this body language, you will be lunch in very short order! House cats, African lions, cougars, foxes, wolves and even our companion dogs stalk in this manner. By the time a puppy gets his little feet under himself, he starts to practice by stalking his litter mates and any other thing that might present itself for play. For the ancestors of our modern dog, as well as the predators of the world, stalking is how they got “dinner on the table.” Wolves often use their stalk to herd their prey, wearing them down and looking for the sick, old or injured in the herd. A small pack of wolves can control a huge herd of caribou. This stalk is what the shepherds of early Scotland began to use in controlling their flocks of sheep. They bred for dogs that could control the sheep with their stalking, but they also bred for endurance and bidability, or the willingness to work with and for the shepherd. The actual act of moving in for the kill needed to be controlled, or the shepherd would be losing sheep way to fast! 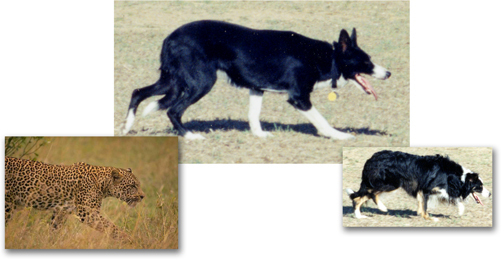 As the stalking action was bred for and refined in the Border Collie, it became something of a signature of the breed. During this stalking, the dog’s total focus is on the sheep, the dog staring at the sheep. This staring can be quite unnerving, as any Border Collie owner can tell you! This has become known as the Border Collie “Eye,” and like any inherited trait comes in varying degrees. A ‘loose eyed’ dog hardly looks at their sheep, and subsequently has difficulty exerting control over the sheep. At the other extreme dog can be so strong that both the dog and sheep freeze up, staring at each other. It is like they are all hypnotized, and it is nearly impossible to get any work done with this type of Border Collie. While the Border Collie’s stare and focus is a major factor in his control of his livestock, it is really only a part of the over all body language of the ‘eye.’ It all comes back to the stalking action. Indeed, there have been Border Collies who were able to work and control their sheep nicely even though they themselves were blind. Relying on scent and sound to keep track of the stock, such a dog still employs the age old stalking motion, turning their face to the stock, and ‘staring’ at them. 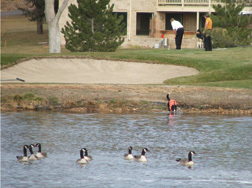 Some 20+ years ago, a fellow by the name of David Marcks was a golf course superintendent in Connecticut, and grappling with the problems too many Canada Geese causing damage to his golf course. After trying all the known methods of repelling the geese, he tried the idea of using dogs to spook the geese away. Experimentation with several breeds of dogs often brought initial success, but most dogs soon tired of the sport of chasing the geese. Most had been bred to fetch something back, and were frustrated when they couldn’t actually fetch anything. 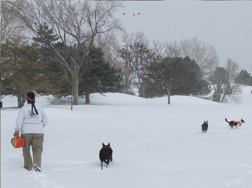 Border Collies proved to be the best bet, showing a willingness to go out after geese, time after time. As any Border Collie owner will tell you, they can be obsessive, compulsive, and high energy. 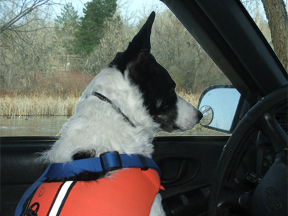 Add in the Border Collie “Eye” and you have a dog that can be steadily used to haze geese. Along the Atlantic Flyway, which lies along the Atlantic coast and the Appalachians, geese have been a major problem for decades. At this time, a land owner/manager can call upon any number of service companies who use Border Collies to haze geese off client’s property. However, here in Colorado there is only one such service, which can cover only so much area. One avenue many have followed is to obtain a dog of their own. When this method of hazing geese was first being experimented with, many of the dogs were either someone’s pet or adopted from a local shelter. Now days, there are a number of trainers offering dogs for goose control. These dogs can seem pretty expensive, but can be well worth it in the long run, especially if the dog is needed for multiple properties. You should have good long conversations with the trainer to find a dog that will fit you and your needs. While I desperately want to see these beautiful dogs adopted out of the shelters, I really have to advise caution with this avenue. These dogs tend to have no training and low socialization skills. They also bring ‘baggage’ with them such as, stubbornness, undefined fears and bad habits. Many things that their past owners could not deal with, and now you would have to deal with, as well as training the dog on goose control. At first blush it might seem to be a cost effective way to go, but in the long run can mean a lot of extra work, heartache and grief. If you choose to adopt, try working with a Border Collie Rescue, where the dog has been fostered for a while, in a home environment. The Fostering family can give you terrific insight into the dog’s personality. You may be able to work out a situation where you can try the dog out, and still have an avenue to return the little guy or gal, if things don’t workout. 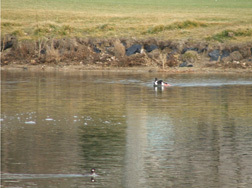 A major factor to consider is that not all Border Collies will chase geese. Some will chase geese at first, but will tire of not being able to round up their critters and herd them back to their handler. Honestly, gathering is what the Border Collie considers successful work, not spooking things. My Skye went after geese a total of two times, effectively sending the geese off. I cheered and told her how wonderful she was, did everything I could to let her know this what I wanted. The third time I sent her out, she ran out about 20 feet, stopped to look at the geese. She then turned around, sat down, and gave me a tipped head look of “Just how stupid do you think I am?” No matter what I have tired, the geese don’t even show up on her radar now. This is a dog who willingly works sheep all day, but sheep she can gather and control, they don’t leave the ground! Another thing you cannot be sure of is whether or not the dog will swim. 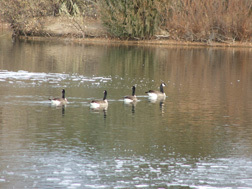 You see, one thing a wild predator will not do, is follow geese into water. It is too much effort for an unlikely catch. This is why the Canada geese like to hang out on or near bodies of water. They can always fly into the water and wait for the predator to give up and leave. Open water is especially a safe place to spend the night. A goose dog that will follow the geese into the water, and chase them around in the water is a terrific asset. The first time a dog follows a flock of geese into a pond, you can watch the shock and confusion among the geese. It is very unsettling for them, that a safe haven is no longer safe. They quickly develop a deep respect of the dog, and soon may not even try for the pond. Unfortunately, not all Border Collies will care to swim. My Fawn, who I consider my good right hand takes a lot of encouragement to swim after the geese, especially once the water turns cold. On the other hand, my Tug is a wonderful swimmer. He is not fast on land, like Fawn is, but in the water, he is a very determined Border Collie. The geese seem to stay around a while longer, trying to figure this strange predator out. This gives him time to herd them back and forth. He actually will take classic shepherd’s flanking commands to push the geese from one end of the pond to the other, or to split the flock up. In a few short minutes, the geese figure out that Tug is really after them, not just fetching a ball like other dogs they have seen. Their once safe haven is not so safe anymore, and they begin to take off in groups. As each group takes off, Tug turns his focus to any geese left behind, until they too, take off. Once they all take off, I’ve seen Tug swim in circles, looking for more geese. He is always disappointed that they have left. One of the tough things about training a dog, is (be honest with yourself), you may not even know what the end ‘product’ or trained dog should look like. What commands will the dog need to learn and how do you teach that command? Yes, this is more expensive, but can make the road a whole lot smoother. A trainer who specializes in this can talk to you and determine just what you need in a dog. There are dozens of questions to be answered before you can be matched with the right dog. Everything from how large a property (or properties) you have to deal with and what kind of property, to where the dog will live, and will there be more than one handler in the dog’s life will come into consideration. A good trainer can not only guide you in the choice of dog, but can give you some training on how to handle the dog. They will already know that the dog will go after the geese, work for more than one person if needed, and swim when needed. Most of them are able to send along a video, and be available by phone to help you. Some are able to actually travel to your location to help you get to know the dog. What ever way you choose to go, take your time deciding, this will be a living, breathing, thinking and feeling creature. Personally, I feel these dogs do best if they are able to go home with their handler, and I have found it is good PR. The general public always warm up to me when they learn that my dogs are a part of the family. This home life can really enhance the working relationship between dog and handler, each being able to better read the other.